Geek Couples: Gwen and Rhys | Warped Factor - Words in the Key of Geek. Tony Fyler checks in with South Wales' finest. Before there was Amy Pond and Rory Williams, there were Gwen Cooper and Rhys Williams (surname coincidence? Hmm…). The settings are different, but the fundamentals of the love story are the same: a girl who’s ordinary in situation but extraordinary in spirit, and a boy who loves her for precisely those qualities. The love story shows the dynamic of dramatic change they undergo when a girl like that finds a world as extraordinary as she is, and runs to join it. Does the boy resist and make her choose between the world of wonders she’s uncovered and his ordinary, anchored life, or does he make his mind up to love her enough to change and go with her, to help her be the woman she could be? Gwen and Rhys both come from solid South Wales stock, and have somewhat ordinary lives. They met at college, fell in love and have been together ever since. When Torchwood begins, Gwen’s a regular South Wales copper and Rhys works for a haulage firm. When she joins Torchwood, it’s almost inherently like an affair, a secret life she lives while striving to maintain a normal life with Rhys. From the very beginning, the sexual element of love is thrown at Gwen left, right and centre – when your first day officially on the job involves you getting hot and heavy with an alien in a female body, it’s going to complicate the ‘good day at work, love?’ conversation more than somewhat if you have it. Of course, Gwen doesn’t have that conversation – part of the point is that she’s the only Torchwood member at the start to have a regular, straightforward relationship outside the base. But there’s aching attraction inside the base too, both with Torchwood medic Owen, with whom Gwen has a brief, torrid and ultimately self-destructive affair, and more palpably with Jack the walking hormone. The relationship between Gwen and Jack is interesting – it’s like a sweet shop for them both, she because he’s gorgeous and glamorous and not in any moment boring, and he because he’s desperately searching in the 21st century for an anchor to remind him what being human is like. 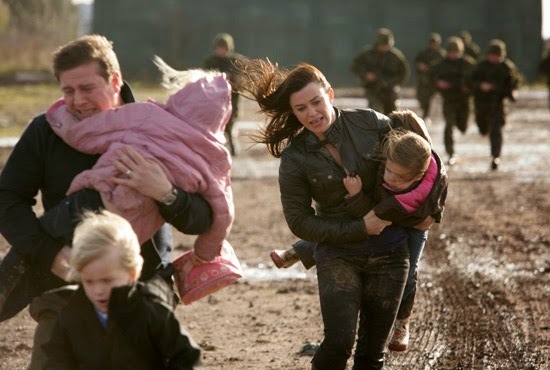 There’s a sense in the first two seasons of Torchwood that Jack would take Gwen from Rhys given half a chance – there’s a selfishness to his need of her that airbrushes out the ‘little people’, which is how he sees complications like Rhys. 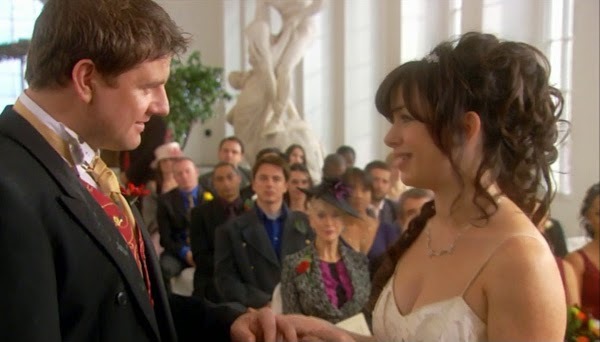 But when Rhys becomes actively helpful to Torchwood in Meat, and Gwen, more importantly, decides she can’t retcon him at the end, she makes her choice and the true love between Gwen and Rhys is proved. She’d rather complicate everyone’s lives to live hers honestly with the man SHE needs as an anchor to normality, than run away with the handsome devil from the future and act as HIS anchor. From then on, the dynamic of Gwen and Rhys is set at least partially in place – far more than the ‘for better, for worse’ shenanigans of marriage, it’s Gwen’s decision to bring Rhys in to her big secret life that shows her commitment to him. And while he might have a whinge about ‘Torchwood, Torchwood, bloody Torchwood,’ Rhys knows he loves Gwen too much not to be there for her. This is no pink fluffy cloud of Valentine’s romance though – he loves Gwen fully, as a human being and a woman, aware of her faults and foibles, but loving her completely all the same. By the end of Something Borrowed, when they’re married, and Rhys has had to hack an alien to bits for ‘impregnating’ his bride and impersonating his mother, there’s a kind of accommodation reached between Rhys and Jack. While we get the sense that Rhys by that point trusts Gwen around the delicious, tempting hormone-bundle that Jack is, it’s the kind of accommodation you can find up and down the country where women work with their exes – an agreement that she’s made her choice, and it’s to be trusted and accepted by each of the males involved, so as not to come to blows in a Neanderthal ‘ownership-battle’ and lower her opinion of both of them. By the time of the events of Children of Earth, Jack has shifted his need for an anchor over to Ianto, and Gwen and Rhys are more together than ever, dealing with the important things in life and going on the run together, though the spark of jealousy can still flare, as it does when Rhys learns that Jack found out about Gwen’s pregnancy before him. This is not an indication that he’s still wary of Jack around Gwen – it’s an indication of the reality and fiery health of the relationship. Arguably, if he’d accepted that calmly, it would have been an indication either that he didn’t care or that he was happy accepting a Beta Male role in her life, which could have stoked Jack’s interest all over again. Rhys will go to the ends of the Earth for Gwen, but he expects her to be there with him. Miracle Day further develops the side on which these two fight. While Gwen goes off with Jack to fight for the human race in all its mortality, she trusts Rhys with what’s most precious to her, their child, and honestly tells Jack she’ll shoot him dead or turn him in rather than endanger her little girl or let him bring harm into her innocent world – a warning of particular potency after his actions at the end of Children of Earth. It’s Rhys she needs with her during the horrors of the aftermath of Miracle Day, when her family is in the direst danger. And in those circumstances, Rhys doesn’t even stop to question – he’s there for her, for whatever she needs, whether it’s lying to the authorities about people hidden in their house, or stealing trucks and driving illegally into medical camps. By that point, he trusts Gwen’s calls implicitly, even if he questions the emotional responses that lead her to them. There’s a moment in Children of Earth where the evolution of their relationship is perhaps best summed up. Running from the law and the forces ranged against them, he tells her ‘Let me carry your bag.’ She looks askance at him – is he pulling the whole macho thing, the whole ‘not in your condition’ thing? ‘You’re gonna want your trigger finger free, aren’t you?’ he explains, and she grins – That’s her man: thinking of the things she needs even before she knows she need them. The lure of the exotic in Jack will always remain for Gwen, but she decides way back in Season 2 that if she’s going to be able to play her part in defending the world with Torchwood, and not have her head turned like Suzy, or take the untakeable risks, like the unattached Owen or Tosh, it’s Rhys she needs to keep her sane – Rhys the anchor to fish and chips, Saturday night telly and paying the gas bill. Rhys the ordinary man who helps her do the extraordinary – till death do them part.